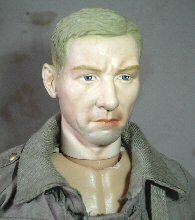 This page is an addition that I have had to make regarding my upgrading of the Terry Davies tank suit, because at the moment I am in the process of re-painting two of the suits. The problem is that I originally was working on one page, but with the amount of detail that I have had to document as I have progressed, it has made the pages grow to four. 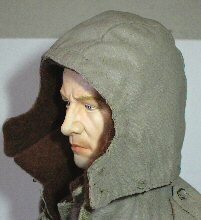 And as a result of that I have placed below how I have added a felt liner material to the collar and hood. 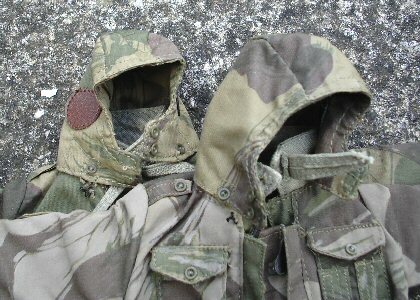 In the picture on the right, one item about the uniform I have found out is that the hood has been assembled inside out. Because the leather ear pads which are on the outside need to be on the inside instead. To change this I cut the buttons on the hood off and turned it inside out, on one of my suits I also had to cut off the buttons on the neck flap because they are now on the inside. For the inside of this I again put some pieces of double sided tape inside it, but because of the round shape I had to use two pieces of felt as shown in pictures 1. & 2. and these have had to overlap slightly. 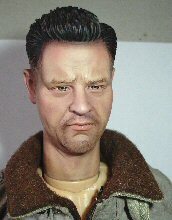 Once I had the tape inside the hood I pressed each piece of felt to the shape making sure it was pressed in tight, making sure that the edges stuck in place. I then cut it to shape around the edges, and where it has overlapped in picture 2. I carefully cut away the inner part of the overlap, and pressed the other piece back into place. 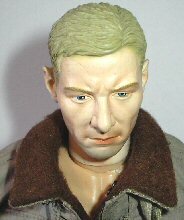 To show how the collar looks on the figure I have in pictures 8. 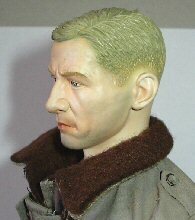 & 9. shown the suit and collar folded down without the hood in place. 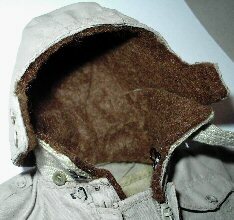 I also had to do the same to the felt inside the hood, and as shown in picture 4. it looks a little bit untidy, but once the hood is on the head that will not show. 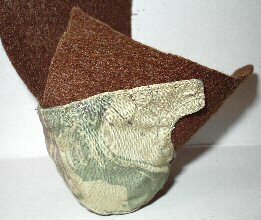 I did think of glueing the felt in place, but that would have only made the pieces stiff and I wanted them to be able to be folded. 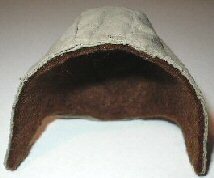 So in the end I cut the felt to a semi-circular oversized rough shape and test fitted it in place as in picture 5. 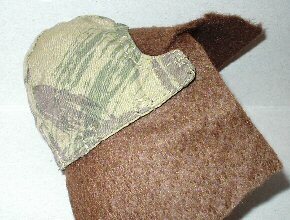 To keep the top part of the felt in place I did try sewing it in place but my sewing skills are very bad and the stitches just looked horrible, so I put some double sided tape on the inside, and the felt was then pressed into place. 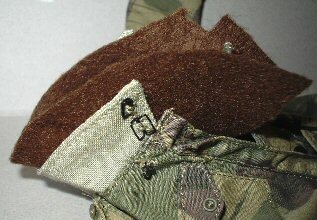 With a pair of sharp scissors I carefully cut around the shape of the collar as shown in picture 6. 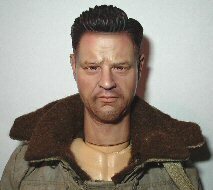 Picture 8. 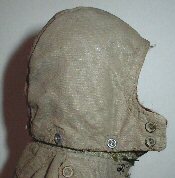 & 9. shows how with the Dragon head and the short neck, the hood fits in place and lines up with the buttons on the collar. 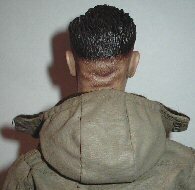 But with the DiD head as shown below in pictures 12. 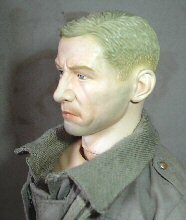 & 13. it has a longer neck which although l would like to use this head for this kitbash, it has created a problem where the hood will not line up with the buttons on the collar. 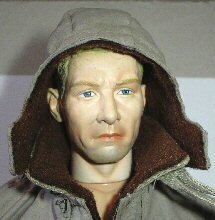 In picture 14. you can see how different the hood looks with the longer neck headsculpt, when compared to picture 10. of the Dragon head plus how the buttons of the hood will not line up. 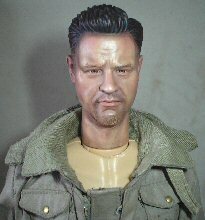 I was looking at the Terry Davies camouflaged suit on the Dragon website, and I noticed how the hood was fitted to the suit and how it was also folded down. 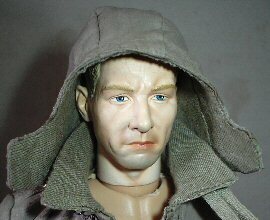 So try to replicate this on my figure, I have had to sew the hood as shown on the right. 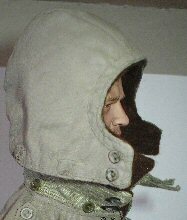 Making sure that the bottom edge of the hood is lined up with the bottom edge of the collar. 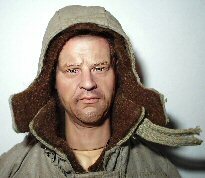 With the other picture on the right, I have pulled the hood up over the figure's head to check that it can be done with the felt material in place. Note: With the DiD headsculpt I have used here the hood is a tight fit, but I found that by using a Dragon head on a Dragon body the hood is a better fit. Pictures 17. 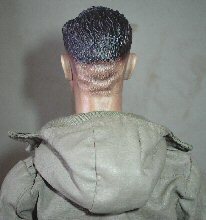 & 18. show where the hood and collar have been folded down so that the hood sits on the back. 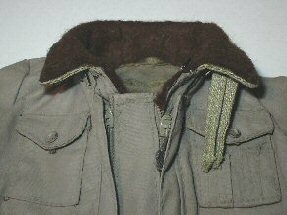 What has to be noticed is that the material is now a double thickness because of the felt, and it is a bit tough to get folded down, but by carefully pressing it down in place I got the hood and collar to lay down as shown above. 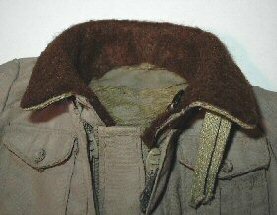 But in the process I found that the felt moved away from the edge of the collar, so to move it back into place I pinched it between my fingers and gently pulled the felt back closer to the edge of the collar. 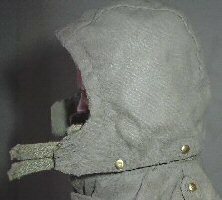 It was brought to my attention that the material that I had used previously for the hood and collar was both too thick, and it was also the wrong colour as well. So I had to find another source of material and I came across a T shirt, that was both a thinner material and near to the colour that it should be. Pictures 19. 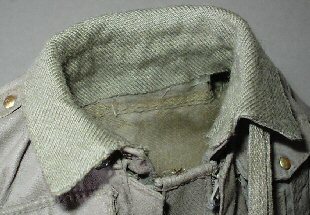 & 20. are of the felt/cotton material that I used, and again I placed it just below the collar on the inside. Picture 23. 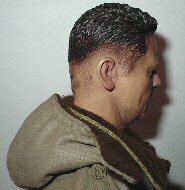 & 24. show the hood resting on the different heads again for size, picture 25. shows the Matt Gold Nailheads in place. And in pictures 26. 27. 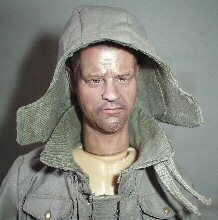 & 28. these show the altered hood and collar folded down after I have fitted the new material. 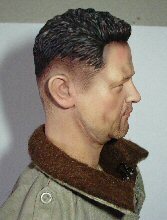 Many thanks to Pete (Old Git) from the OneSixth UK forum for his kind permission to allow me to use his images as reference material. 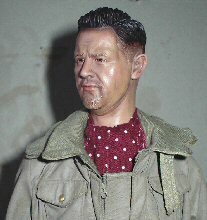 And Tony Barton for his original tutorial about repainting a uniform.